This entry was posted on Tuesday, April 9th, 2019 at 7:31 am. 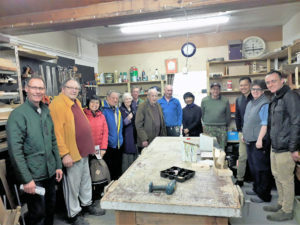 A recent visit to Westbury Shed by a team of consultant healthcare professionals from Singapore was facilitated by Steve Hubbard, Westbury’s local area co-ordinator. The team was in Wiltshire investigating how local groups function to benefit their local communities and to take away ideas and strategies to develop in their communities back in Singapore. They were particularly interested in how activities brought individuals together, how members were able to share life experiences, support each other in learning new skills and engage with their community. The visitors were so interested in meeting and talking to members, and impressed with what they found, that they overran their timetable for the day. It is hoped that this newly formed international relationship will continue in the future and result in sharing of information across the miles and cultures.